Wolfenstein 2 The New Colossus Perks - How Will You Customise Your Character? In Wolfenstein II: The New Colossus, you will be free to play your way. Do you prefer to skulk around and pick off enemies one at a time? You can. Rather stay at a distance and take your enemies out with precision headshots? Sure. Would you rather put a gun in each hand and wade in? That’s also an option. Hell, you can even upgrade yourself so that you can literally run through enemies and see them explode in a cloud of gibs. Wolfenstein II’s perks work in the same way as they did in the last game - they identify your preferred playstyle, tracking how you play and unlocking abilities to suit. Keep sneaking and you will get more abilities based around stealth. Go in guns-blazing and you will get better weapon skills. Rewarded for killing enemies using heavy weapons. Reward: detached heavy weapons have larger magazines. Rewarded for killing enemies with the Handgranate. Rewarded for killing enemies while dual-wielding. Rewarded for getting in close and killing opponents using combat takedowns. Rewarded for killing enemies by tackling them while using the Ram shackles ability. Reward: dropped enemy armour pieces are more effective. Rewarded for killing enemies while health is overcharged. Reward: health overcharged deflates slower. Rewarded for killing enemies with environmental hazards like explosives. Reward: reduces damage taken by explosives. Rewarded by killing enemies with their own grenades, either by shooting one before it is thrown or by tricking them into blowing themselves up. Reward: enemy grenades take longer to explode. Rewarded for killing enemies by shooting them in the head. Reward: do more damage when aiming down the sight. Rewarded for killing enemies while using the Battle Walker ability. Reward: dropped enemy weapons carry more ammo. Rewarded for killing enemies by using flames. Reward: reduced damage taken from diesel weapons. Rewarded for stunning enemies with electric-charged grenades and killing them while stunned. Reward: reduced damage taken from laser weapons. Rewarded for taking down commanders before they activate the alarm. Reward: suppressed weapons do more damage. Performing stealth takedowns on or tampering with robotic enemies. Reward: tampering rewards laser and diesel ammo. Rewarded for killing enemies while using the Constrictor harness. Reward: move faster when using Constrictor harness. Rewarded for using stealth takedowns. Reward: move faster when crouched. Rewarded for searching dead commanders and finding Enigma Codes. Reward: jame commander alarm signals and delay their transmission. Rewarded for killing Nazis with a thrown hatchet. If you are looking to grab Wolfenstein II come launch day, here are all the editions and what you get included. 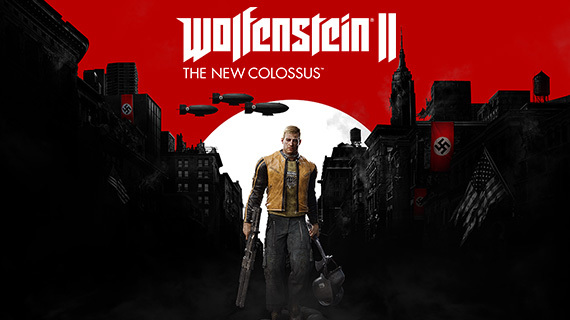 If you have ever played a Wolfenstein game before, it will come as no surprise that the big baddies in Wolfenstein II: The New Colossus are the Third Reich. Here's a breakdown of all the new features you can expect to find packed into The New Colossus.